Background: This incident is to highlight utter negligence by team of healthcare diagnostics startup Healthians which led to patient being admitted in hospital ultimately resulting in a hefty bill of Rs. 68,900+. For the records, the Gurgaon based company had raised $3million USD in funding last year from the Japanese Investor Asuka Holdings. The company is backed by cricketer Yuvraj Singh and was co-founded in Feb 2015 by Deepak Sahni and Anuj Mittal. How does Healthians work/claim to work? 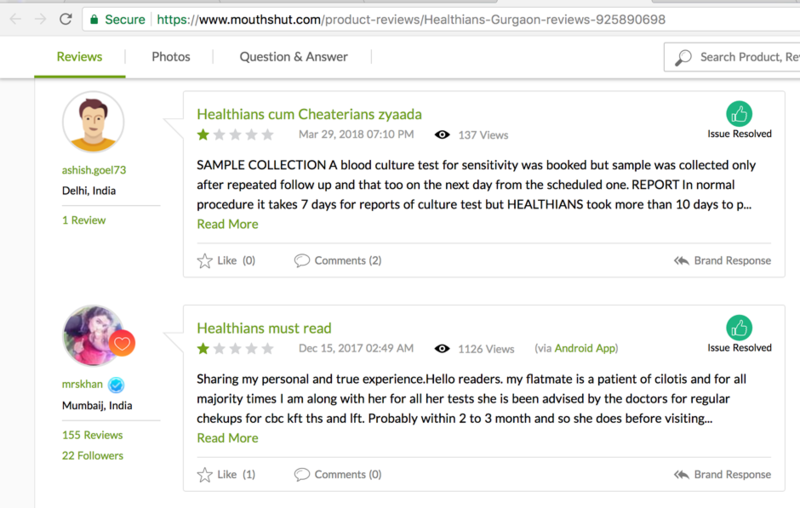 Healthians, is a an aggregator of diagnostic report providers providing door-step medical tests to consumers at competitive pricing. 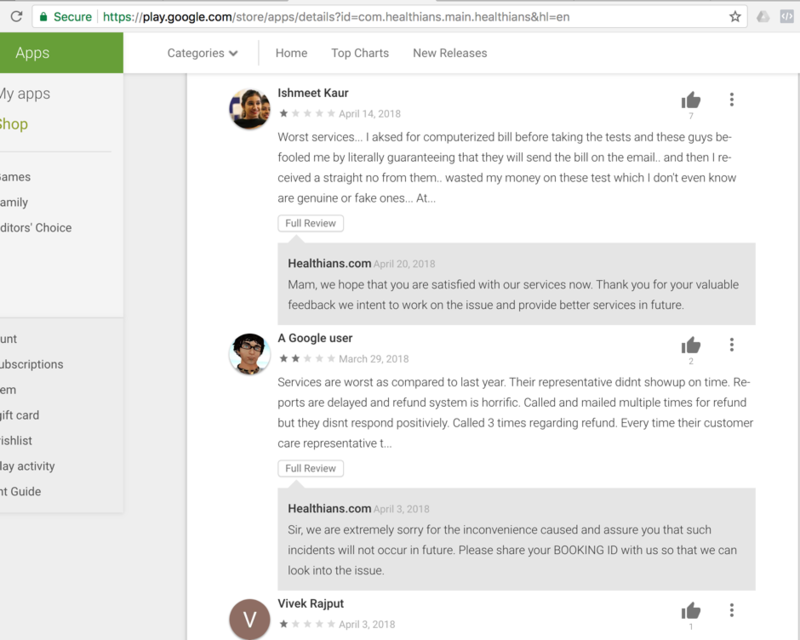 A review of the Android app, shows negative reviews from disgruntled customers who are unhappy with level of services provided. The story on Mouthshut.com, another online review site isn’t different with a sequential flow of negative reviews. The latest post on their Facebook page, again shows negative reviews from customers talking about delay in reviews, destruction of blood samples etc. 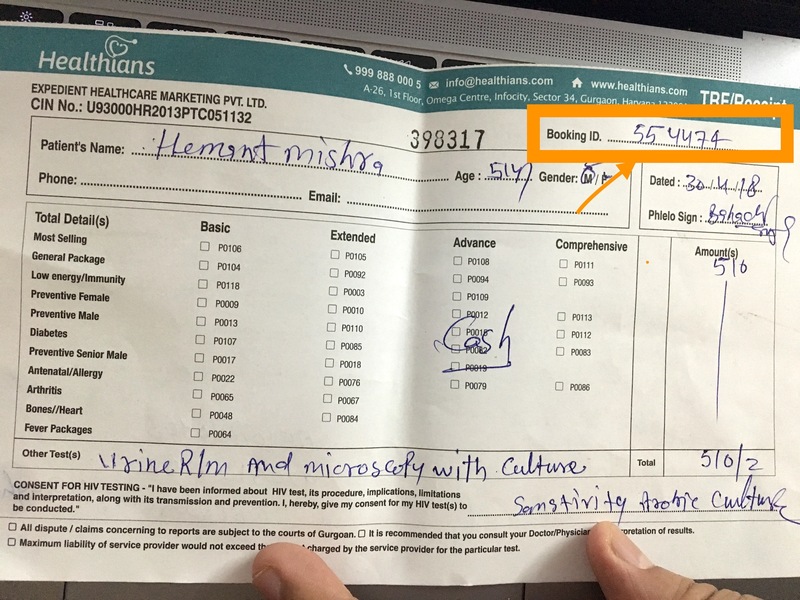 Booking Id: 554474 On Monday, 30th April 2018 morning at around 8:00am urine sample was collected for Hemant Mishra, brain hemorrhage patient, for urine routine and urine culture. The turnaround time for urine routine is same day so the patient’s family was told that report will be available by Monday evening i.e. 30th April evening (Official communication states that the company provides report the next morning before 12:00pm i.e. 1st May before 12:00pm). The family waited till 30th April evening and didn’t get the report. Needless to say, the report was critical as basis it, the patient was supposed to take a medicine. The patient was suffering from 102 fever with chills. On 1st May 2018, i.e. Tuesday morning the patient’s family called the lab again asking for report and they were told that the same will be delivered by evening. They received the same response when they called the lab in the afternoon. Moreover, the lab administration tried to identify multiple excuses to make up for the delay of the report. When the family called the agent who had collected the sample, he told them that report would take time as the lab people were scared seeing the infection. On 1st May 2018, evening they were told that there was some issue in the system and the report would be available by 10 pm. The family waited but unfortunately no report was sent. 1st May 2018, Tuesday night the patient got critical and he had to be admitted in ICU. When they called on 2nd May 2018, Wednesday morning at around 10 am they were told by Ms Ekadashi that the report would be sent in half an hour. We waited till 12 but didn’t get report. On calling again, Ms Priya told the family that they could not get the report as sample collected was not sufficient. They then spoke to Ms Paramveer, the officer in charge and he apologized and told that the system was down since Monday so they couldn’t figure out if the sample collected was sufficient or not. Among many excuses, they also said that the report wasn’t given since they were planning to give both routine and culture report together. Finally one the executives, Paramveer decided to help. He called informing that urine routine was conducted as for urine routine the sample was sufficient but culture could not be conducted. In around an hour Paramveer mailed us the urine routine report and promised to give the urine culture by evening. He mentioned that culture was also done. Amidst all this discussion, the patient’s condition worsened due to non-availability of antibiotic, which was supposed to given after the delivery of report on advisory of physician. The patient was admitted to Jaypee Hospital on Wednesday, 2nd May 2018 at 01:48 am. Since his condition had deteriorated, he had to be admitted to ICU. 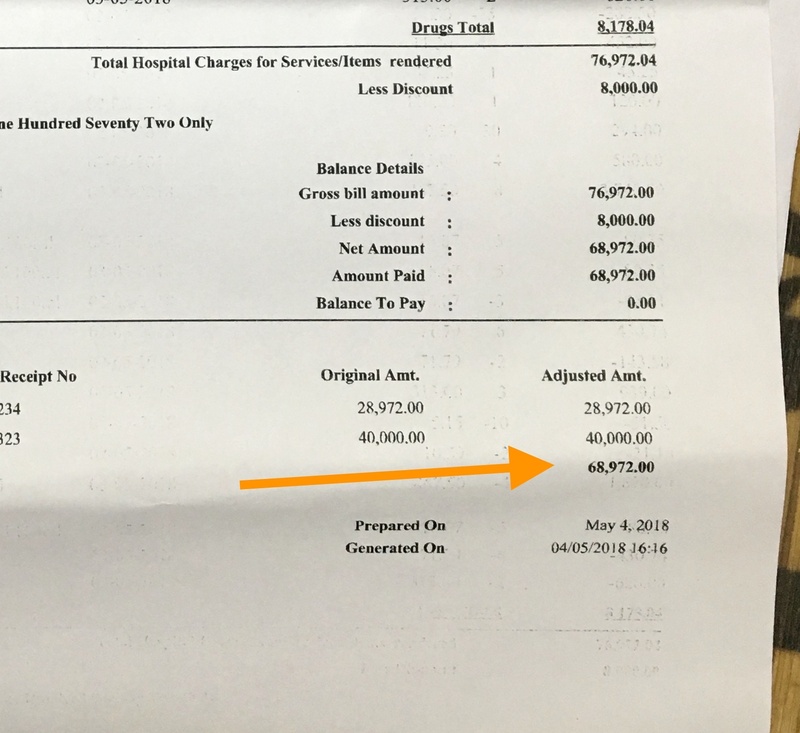 The patient was discharged on 4th May 2018 not before a bill of Rs. 68,972 was issued. Considering business of healthcare as a commodity business. Offering patient’s family 50% discount on next purchase. (Refer: screenshot of apology email and offer of 50% discount). It shows, complete lack of respect towards patient’s family and the financial/emotional problems they had to go through during this period). 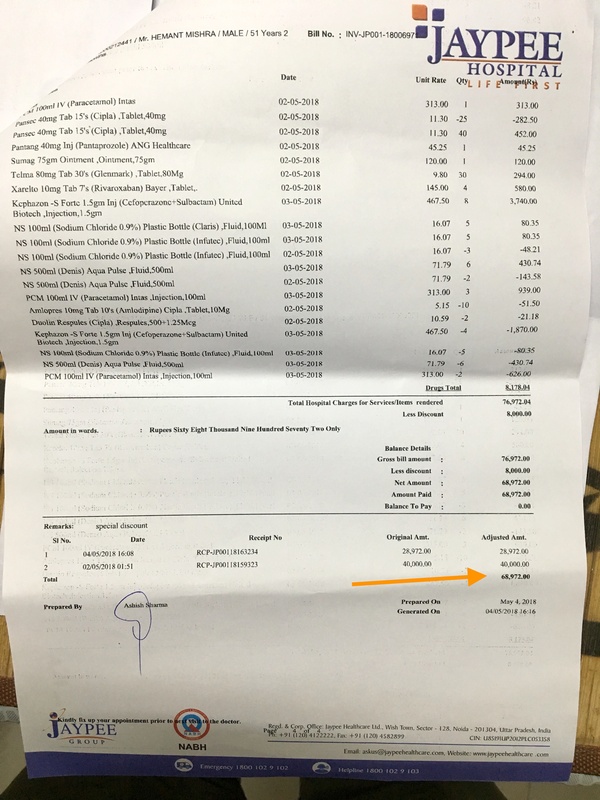 This blog-post is an appeal to the management of Deepak Sahni and Anuj Mittal, to apologize on behalf of Healthians and claim full responsibility for the sequence of events which led to patient being admitted in the hospital thereby resulting in a bill 68,972 INR. The patient’s family has undergone severe medical expenditures and this entire incident could have been avoided if Healthians team would have acted more responsibly. 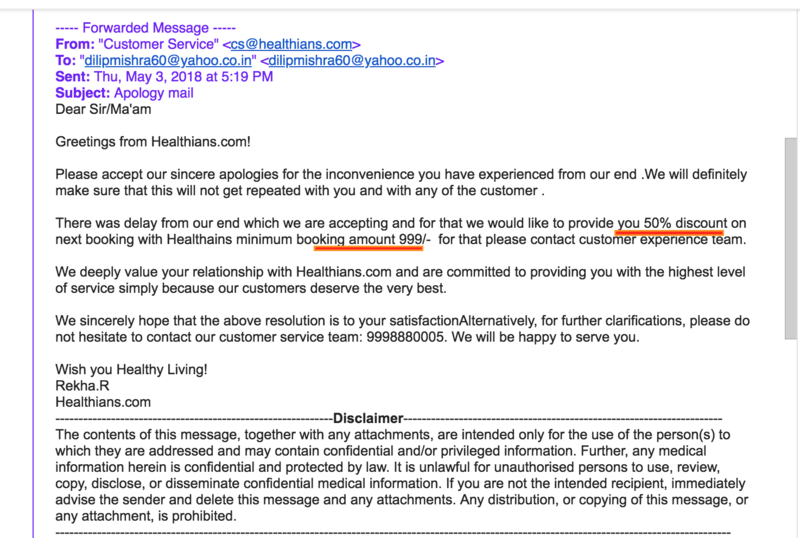 Thereby, Healthians team needs to issue a full refund for the said amount to patient. A copy of bill-summary is attached. Response from management accepting their mistake. NOTE: The patient is my family member and uncle. I was travelling overseas when this incident happened. This post has been written after due consultation and summary of experiences shared by my family members. Such a bill might gives a patient a heart attack. But Sir, Health industry is at boom in India.